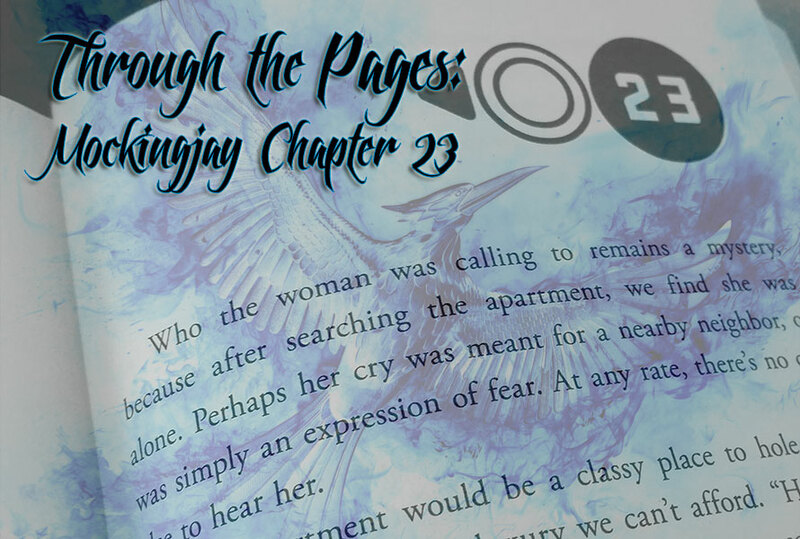 Hello everybody and welcome to the next installment of our Through the Pages series! We’re in the final stretch before the movie comes out so we’re going to start cranking these out faster. Unlike the previous installments, you’ll only get one chapter today, but worry not, you’ll see the next one within a week. After Katniss kills the Capitol woman, what’s left of the squad attempt to determine their location. They look out the apartment’s window and see crowds on the street; Cressida surmises they’re a few blocks from Snow’s mansion. They’re still trying to calm down and process what they just went through. 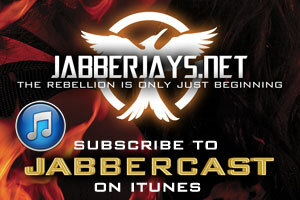 Katniss tries to free Peeta of his handcuffs, but he asks her to let them on as they help him keep control. They disguise themselves with Capitol clothes and put on makeup before they leave the apartment. Once they’re on the street, a broadcast comes on, talking about their dead comrades. Cressida leads them to a grimy storefront where she greets a woman who has gone through so much cosmetic surgery, Katniss considers her extreme, even for the Capitol: her name is Tigris, and she used to be a stylist in the Hunger Games. She gives them refuge in her cellar. Katniss stitches Gale’s neck up; when he passes out, she tends to Peeta’s wrists, and they have another “Real or not real” conversation, this time about their first Games. The group decides to sleep for a while, and Katniss has a weird dream about traveling with Effie. When she wakes up, she thinks about all their squad mates who died in the last day. She feels it’s all her fault, even when the others try to convince her it isn’t. They brainstorm ways to get Snow out in the open so they can kill him. Katniss thinks she should give herself up, so that Snow will want to execute her publicly and another squad member can kill him then. Later, Tigris calls them up to eat and they decide they should split up, to make it easier to infiltrate Snow’s mansion. When they all go back to sleep, Gale offers Peeta water and they have a conversation in which they commiserate about their feelings for Katniss. They both agree it’s Katniss choice, who she wants to be with, if any. 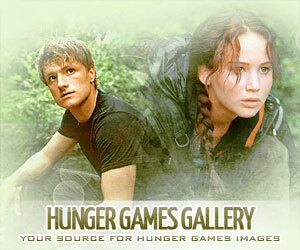 Gale states that she will choose whoever she feels she can’t survive without. As I said for Through the Pages Chapter 22, I want the moment where Katniss kills the Capitol citizen in the movie. It says so much about the nature and innocent casualties of war. However, instinct tells me they will leave the lizard mutts and the meat grinder and instead of entering this woman’s apartment, the remaining members of Squad 451 will arrive at Tigris’ shop. I’m guessing Cressida could lead them there after the “Stay with me,” “Always” moment. Thereby cutting out needless camouflaging to end up back indoors again. It doesn’t make sense to adapt this when we could be straight with Tigris and not disrupt the pace. The moment, on the street, when the sirens start and the faces of the rebel fugitives appear can easily happen later when Katniss and Gale leave to head for the mansion. Hopefully after seeing Tigris, Cressida can quickly explain that she is an ally of Plutarch’s and perhaps describe her as an ex-stylist. But I doubt too much time will be spent establishing her outcast status from the Games after her looks have gone. We only truly need to know that she is an ally in the Capitol and her shop will be a place to re-group and plan. We already know, thanks to Ve Neill, that Gale’s neck injury has been included. Seems possible that Katniss and/or Cressida could treat the wounds of Gale and Peeta and try to give brief comfort to Pollux’s grief. I’m sure we’ll get some grade-A Jennifer Lawrence acting of guilt with no dialogue before she confesses to the group that her mission was fabricated and she sent eight soldiers (friends, really) to their deaths. The dialogue from the full trailer that we hear Peeta utter, about making their deaths mean something if they kill Snow, is bound to be from right here. Seems the perfect time to remind her why she’s doing this and why they should continue. Resolve can be taken and they can look at their map to establish the final goal of the movie: how far are they from Snow’s mansion? The Capitol news coverage could be in there or perhaps we could cut to Snow (or indeed Coin at this point) to discover what their plans are and perhaps see a brief glimpse of what propo the Capitol is being fed. I don’t know how much interaction will be had with Tigris but seems a waste not to use such a visually striking character. I’m looking forward to the conversation between Peeta and Gale. We haven’t seen them interact and it’d be nice to finally have a scene between Josh Hutcherson and Liam Hemsworth so I’m sure it’ll be engaging. I don’t think it’ll be verbatim but I’m sure it’ll be some variation on their shared interest in Katniss. I have trust in Danny Strong and Peter Craig that it won’t be of the cheesy variety. Honestly there’s nothing really verbatim I’d like in there. I never was a big “… the effect you can have” person (I’m a “Stay with me/Always” kinda gal!). My favourite lines of this chapter are all within Katniss’ head. And I have complete faith that Jennifer Lawrence is going to have those lines in there without even uttering a word… damn she’s good! Much like Ciara, I don’t believe Katniss killing that woman will make it in, and so I think they’ll go straight from the sewers to Tigris’ basement. This chapter is a lot slower than the previous one, but I believe there are some important conversations that will make it in. The brainstorming they do about their location and how to get Snow out in the open, for one (I think this is where all those stills of Cressida, Gale and Katniss in the basement comes from). I doubt any of the little moments with Tigris will be included, and I’m kind of still debating with myself whether or not Tigris will actually speak in the movie (I’m thinking you don’t get Eugenie Bondurant for the role if she’s not going to speak, but in my head I always see her communicating with gestures and signals even after having just read the chapter, because I think she’s so much more striking as a visual). I do hope we get to hear Katniss verbalize her guilt at having led everyone into a suicidal mission, with Gale and Cressida trying to convince her otherwise. I think we’ll get some lovely expressions from Jennifer Lawrence if that’s the case, but I don’t think they’ll leave it at just her expression. She’ll express it out loud, I’m positive. The real/not real conversation with Peeta might not happen, particularly because the first movie didn’t go into most of those events they mention. Instead, I think they’ll have Peeta jump more fully into Katniss’ defense when she’s feeling guilty. I believe that’s what his lines in the last few TV spots are. The Gale/Peeta conversation at the end of the chapter, however, is one of those scenes that I think are so important, I’ll be really upset if it’s not included. And I’m fairly certain it was filmed because we’ve heard Josh and Liam talk about it on interviews, so I really hope it doesn’t end up on the cutting room floor somehow. It might not be in there verbatim (they’ll probably paraphrase to make it flow better) but I think it’s pivotal to show how similar the two boys are even with all their differences; that they empathize with each other even if they don’t necessarily like each other; and that they both care for Katniss very much and appreciate the part the other had in helping her, each in their own way. It’s one of my favorite moments in the entire series, and I really do think it’s key to understanding both characters. “Katniss will pick whoever she thinks she can’t survive without.” –Gale. This chapter is the introduction to one of my favorite characters: Tigris! I know that I’m not alone in this, either; she’s got quite a fanbase. When I first read about her, I pictured her as an older woman with wrinkles and long whiskers and a ton of plastic surgery–but I actually prefer the film version rather than the one I first imagined. Based on what we’ve seen in the trailers, Eugenie portrays Tigris with elegance and a ton of self-confidence; did you see how she holds herself in the final trailer as Katniss is about to shoot her? I can’t wait to see what Eugenie does with this role. I was never really a huge fan of this conversation between Gale and Peeta. It just feels a little bit too, I don’t know, immature? It also mirrors a particular scene in Eclipse by Stephenie Meyer, but there I think it really worked since Edward and Jacob were literally the center of Bella’s universe at the time. Meanwhile, Peeta and Gale and the love triangle are not the focus right now. They are in the Capitol trying to execute Snow. I won’t mind if they keep this scene in the film, but I also won’t mind if they don’t, either. I’m with Ciara on this one. Katniss has some great lines in this chapter (the one about how freaky Tigris looks is great), but again, they’re all in her head. I’m excited to see Jen’s reaction to seeing Tigris for the first time!